Trade a dress for a dress and Get rewarded with Haute-Points. Trade your Haute-Points for another dress! 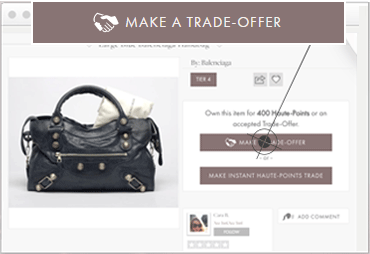 Make and receive Trade-Offers for your gently-loved designer bags, shoes and clothing. You have the option to accept or decline for any reason. But for every accepted item-for-item(s) trade you do complete you’ll also be rewarded with our exclusive currency Haute-Points! As stated above, when you complete an Item for Item(s) trade you are rewarded with Haute-Points of equal tier value to the fashion(s) you traded. 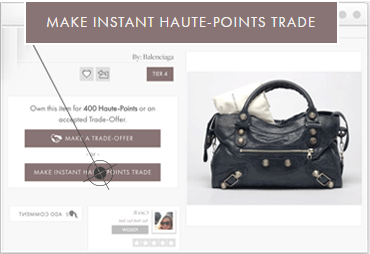 For Example: If you successfully TRADE a Tier (2) fashion item, in addition to your newly received fashion(s), you‘ll also receive a trade reward of 200 Haute-Points!!! You can spend the 200 Haute-Points like cash for another Tier 2 listing (An Instant Haute-Points Trade), or you can accumulate more Haute-Points and get higher Tier fashions! 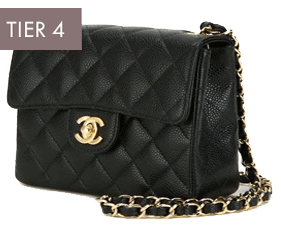 We accept authentic and well cared for shoe, bag and clothing listings, made by select labels ranging from DVF to Chanel Couture. Every accepted label has an assigned Tier value of 1 through 4. The Tier number shows you the trade value and Haute-Point value of your listing. 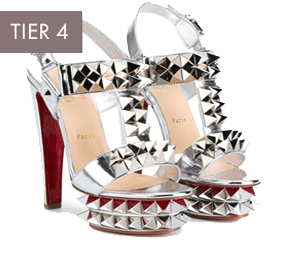 To learn more about Haute-Points or Tier values (Click Here). To see our list of accepted designers (Click Here). You may add optional Premium protection to your luxury Tier-4 listings. With Premium protection, your traded item and the corresponding trade are sent to HauteTrader HQ, where they are cleaned, authenticated and inspected. The trade is only completed if both items are authentic and in the condition as represented on site. To learn more about Premium listing (Click Here). Tier 4 Bags listed as premium are given the option to not accept Instant Haute-Points for trade. You can tell if an item is listed as "Premium Not Accepting Haute-Points" by the (PN) icon, which will be placed next to it. Note: Because our trading and virtual currency reward system is reliant on community participation, if you list your item as premium and opt out of the possibility of accepting Instant Haute-Points trades, you will not receive an Haute-Points reward at the completion of your trade. 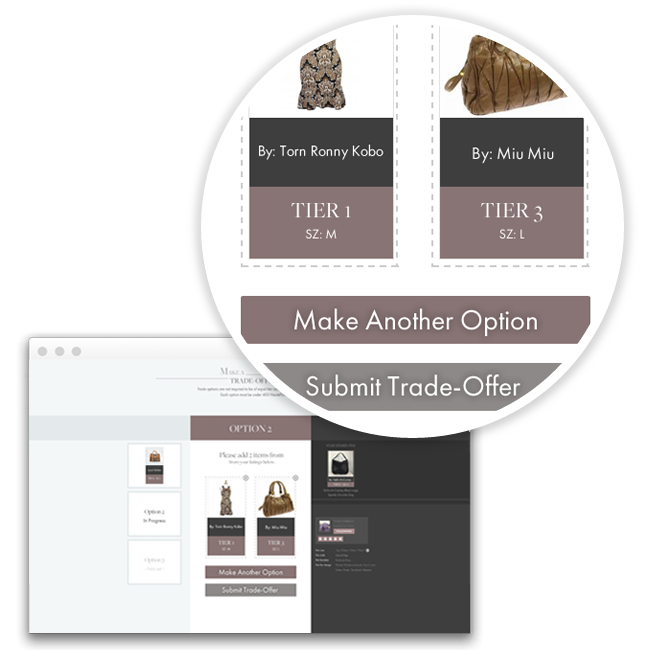 To increase your chances of getting your desired fashion item you can submit up to three options within a single Trade-Offer. All trades include free shipping. Upon trade offer agreement or Instant Haute-Point trade submission, we provide you with a pre-paid USPS shipping label. 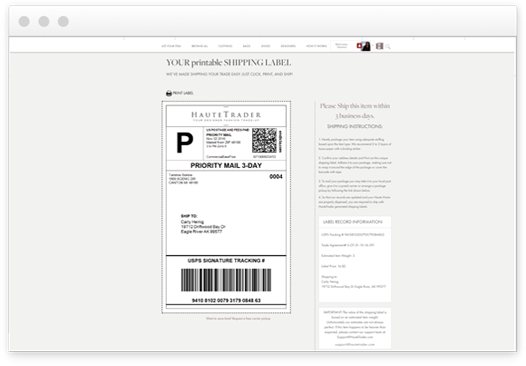 Labels include onsite door-to-door tracking and signature confirmation.